Our sweetened condensed milk is Longevity Brand--the brand of choice. 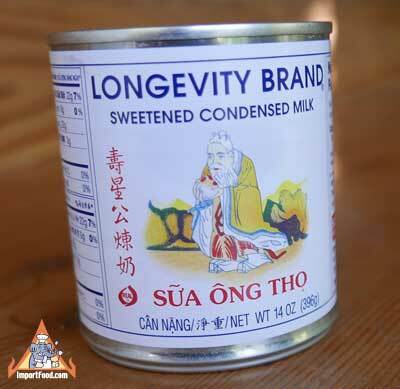 Longevity is recognized as the finest quality and excellent when added to Vietnamese coffee. Also find this as a necessary ingredient in Roti (see recipe). Ingredients: grade A whole milk, refined sugar. You may have heard of roti, they are similar to tortillas (flat bread) fried in margarine or clarified butter, flavored with all kinds of different things such as condensed milk, banana, chicken curry, raisins, etc. Roti vendors sell this in many Asian countries.